Buford Betty: Funnel Cakes for Breakfast! You know, it's probably a really bad thing that we figured out how easy these are to make at home. But it's too late now! Anyway, so the hub was after something *fun* for breakfast this morning and out of the blue he came up with the idea of making funnel cakes. 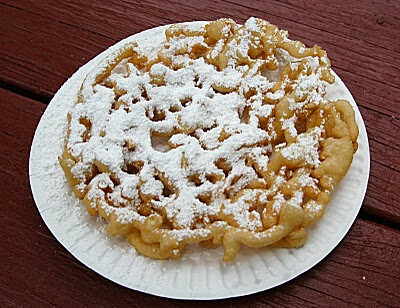 Like when was the last time you ate a funnel cake? Seriously. I don't have much of a sweet tooth myself, so after a few bites I've totally had my fill. But the hub LOVES them. So we looked online for recipes and found one that used pancake mix. Check! We've got that. And we happened to have powdered sugar on hand too. This was all the hub's doing really. I was the powdered sugar sprinkler. He tweaked the recipe some (it called for additional sugar in the batter and we both think it was totally NOT needed). - Combine the pancake mix, egg, and water and pour into a squeeze bottle or ziplock bag. If using a bag, snip off one of the bottom corners so you can easily pour the batter into the pan through a small opening. - When ready, squeeze out the batter in a circular pattern into the frying pan. Do this quickly as it will cook within seconds. So it doesn't look like a big blob, leave some open spaces as you're pouring in the batter. Once it's golden brown on one side, use tongs to flip it over and cook the other side till it's golden brown. - Remove from the oil and transfer to a paper plate. Sprinkle with powdered sugar and serve immediately! OK so obviously these are not at all Moo Goo friendly. I ate my normal breakfast of one boiled egg and some turkey sausage. But I did have a few bites of one of the cakes. Maybe more than a few. I kept saying, "Well, the batter is really spread so thin... I'm really eating a very small portion of the non-Moo-Goo-friendly pancake batter." But, diet or not, I gotta say these TOTALLY tasted like the real deal! I did not take any pics, but I'm tellin' ya they looked exactly like the one above - paper plate and all. They were ridiculously good - too good. Duh, it's fried. But they are super easy to do and would be a very fun once-in-a-blue-moon treat. I told the hub, "oh when we have kids this is totally gonna be their birthday breakfast!" Not at all healthy, but a crazy treat now and then won't kill ya I don't guess. Though the hub remarked, "Hmmm... that sure did use a lot of oil. I'm not sure where it all went!" I replied, "into your arteries!" Good for you! Treats are important. And you've been so good on Moo Goo- a little fun is good for the soul. So delish. We used to make them for a Heritage Day celeb at the high school! We actually used a funnel b/c we only allowed the students to do things authentically per "olden days". Very fun! !